Mysterium is a cooperative murder mystery board game. The game is a marriage of Clue and Dixit. A group of investigators enter a haunted house. With the help of a ghost, they try to figure out who committed a nasty murder. 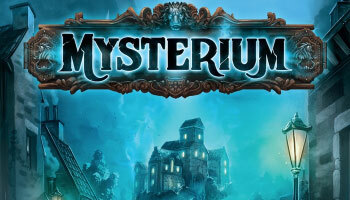 One player takes on the role of the ghost while the others are mediums that attempt to help the ghost to remember the details of his own murder: suspect, location and the murder weapon. At the start of the game, the ghost player selects a suspect, location and murder weapon for each medium to guess. The ghost give clues to the mediums through a series of visions in the form of illustrated cards each hour. The mediums progress through the stages by correctly guessing their respective suspect, location, and murder weapon. After the 7th hour, the ghost reveals to each medium whether the guesses were correct or not. If all of the mediums are able to figure out their suspects in time, one more round happens and the players work together to figure out who the real murderer is. If they succeed in time, everyone wins the game (including the ghost). 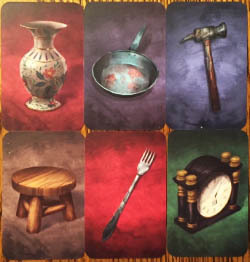 It looks like Mysterium is a horror game, but it's actually very family friendly because of the interactions between the investigators and because the game is easy enough to play for all ages. To play the ghost is the hardest. You have to try to find the right clues for each medium. The game can be quite challenging as the ghost has many image cards and they won't always be the best cards to guide the mediums to a correct answer. The mediums will need to interrupt the image cards in many ways, perhaps linking similar items in the picture to a person or location, or finding similarities in style or color. 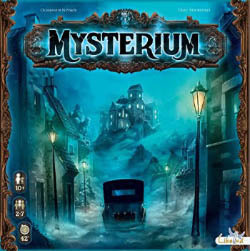 Mysterium can be played by 2 - 7 players but is best played by 4 or 5 players. The rules don't change no matter how many players are playing. You can also add more cards to make the game more difficult. A game take about 45 minutes to one hour. The game was created by Oleksandr Nevskiy and Oleg Sidorenko.